DNS should be flushed every now and then on your Linux system to avoid IP address conflict. DNS (Domain Name Service) is responsible for mapping a website name into the respective IP. Click here to know how to install and configure DNS on Ubuntu. Therefore, DNS is considered being one of the critical parts of your connection to the internet. In order to access the frequently visited websites faster, our machines keep track of DNS records, or in other words, it caches it. What if a website changed its address? It may cause an IP conflict. So, to avoid such problem, your machine DNS cache should be flushed regularly. Also, clearing your DNS cache will help you removing unneeded data occupying your system and solve some technical problems related to the famous “outdated entries” error. In this tutorial, we will show you how to flush your DNS on Ubuntu and CentOS operating systems in easy and clear steps. Step 1. Before flushing your DNS, you can check DNS statistics using the next command. As per the previous screenshot, the current cache size is 6. Step 2. 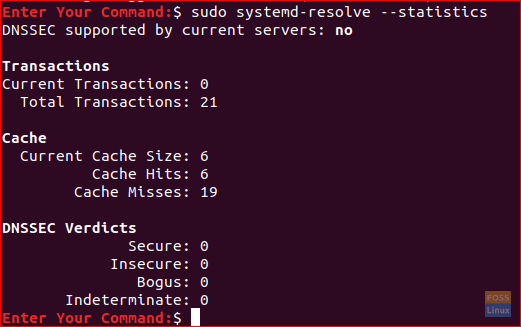 Flush DNS using systemd-resolve, since the systemd-resolve daemon is almost running on all Ubuntu systems, then we can use it to clear our DNS cache using the next command. Step 3. Re-run the cache statistics command. As you can see from the above screenshot, the current cache size parameter is Zero, and that is what we need. To clear your system DNS cache on a machine running CentOS platform you can use the following command. 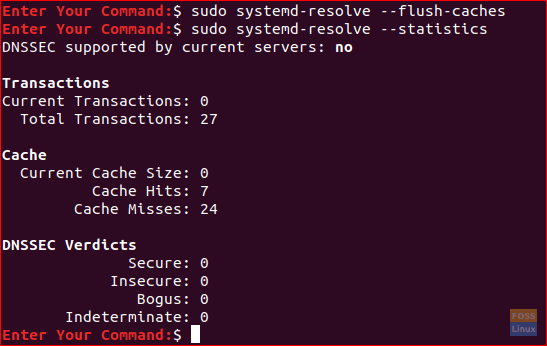 That’s all you need to know on how to flush DNS on Ubuntu and CentOS. For any further questions leave us a comment, and we will be happy helping you.